The second edition of this book has now appeared. Please see http://empslocal.ex.ac.uk/people/staff/gv219/aofd for details. This book contains material on four general topics: (i) fundamentals of GFD (including equations of motion, effects of stratification and rotation etc. ); (ii) waves, instabilities and turbulence (including wave-mean flow interaction and geostrophic turbulence); (iii) the general circulation of the atmosphere (theory of Hadley and Ferrel Cell, theories of stratification, maintenance of the westerlies etc. 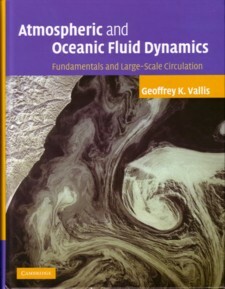 ); (iv) the general circulation of ocean (gyres, theory of the overturning circulation, thermocline theory etc.). The book is available both as a conventional printed book and as an ebook (see the Browse and Buy page).